This is a guest post from Cameron Leckie of ASPO Australia. The first post on this series on the future of air travel1 looked at the fuel economy of the aircraft fleets in service with QANTAS and Virgin Blue on fuel economy and fuel economy per passenger perspective. Not surprisingly, the smaller aircraft were more economical than the larger aircraft, however the larger aircraft, in general, were more economical on a per passenger basis. Thank you for all those who commented on the previous post and the information that you provided. This post gets to the crux of the matter. Profit and loss! No business can survive on sustained losses; sooner or later it will become insolvent. This post will investigate how long Australia’s two largest airlines, QANTAS and Virgin Blue can remain profitable in the era of high oil prices. How long can they remain profitable? This post will examine in some detail Australia’s two largest airlines with the aim to establish how long they will remain profitable in an era of high oil prices. The approach taken is to develop growth figures across a number of categories based on the airlines historical data. The data has been obtained from the financial reports of both airlines.2 The time frame that has been used is from FY 2003/04 through to 2006/07. The historical growth rates will then be projected forward until 2018. After developing the base case, a number of differing scenarios will be developed that will provide an indication of how long we can expect the airlines to remain profitable. The factors that have been considered and the per annum growth rates over the period are displayed in table one. Expenses (less fuel) 5.1% 6.7% This has been calculated due to the different growth rates in non fuel expenses and fuel expenses. Available Seat Kilometres (ASK) 4.3% 8.3% Measures the airlines capacity growth. 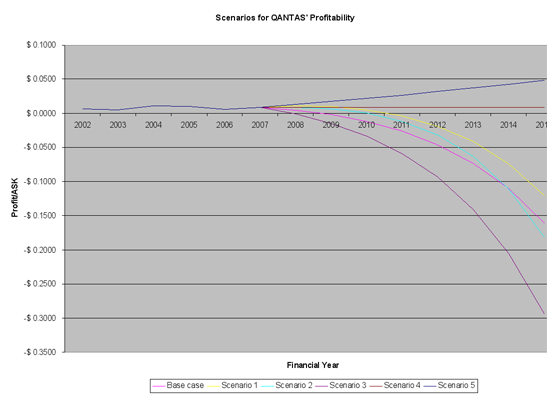 Table One: Factors considered in determining the future profitability of QANTAS and Virgin Blue. This table shows that expenses have been growing at a faster rate than revenue for the last four financial years, mainly due to the significant increase in fuel costs over that period. To determine the airlines future profitability, the revenue and expenses of the airline have been related to its capacity, or Available Seat Kilometres (ASK) giving two values, being revenue per ASK (R/ASK) and expenses per ASK (E/ASK). For as long as an airline can keep R/ASK greater than E/ASK an airline will remain profitable. Using the historical growth rates, a baseline (or business as usual) projection has been made for the period 2008 to 2018. The non fuel and fuel expenses have been calculated separately and summed to provide the projected expenses. Using this baseline projection, fuel as percentage of total operating cost, increases from 24% in 2007 to 58% in 2018 for QANTAS and 27% to 75% for Virgin Blue. 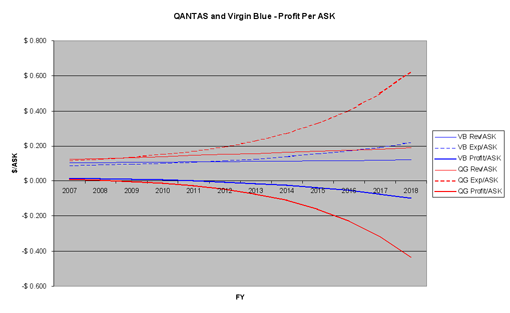 Chart one and two detail the future profitability of QANTAS and Virgin Blue respectively using this baseline. Chart One: Baseline for the future profitably of QANTAS and Virgin Blue. Based upon historical growth rates for the period FY 2003/04 to FY 2006/07 projected to 2018. Scenario one. Revenue, fuel costs and capacity growth continues to grow at historical rates whilst on-fuel costs reduce. Scenario two. Revenue and fuel costs continues to grow at historical rates (calculated according to provided capacity), whilst non-fuel costs and capacity reduce. Scenario three. Fuel costs continues to grow at historical rates (calculated according to provided capacity) whilst revenue, non-fuel costs and capacity reduce. Scenario four. Fuel costs remain constant relative to capacity whilst revenue, non-fuel costs and capacity reduce. Scenario five. Fuel costs remain constant relative to capacity whilst revenue, non-fuel costs and capacity increase at historical rates. 2% per annum has been used as the figure declining costs, capacity growth and revenue. Obviously, higher or lower figures will result in changes to the predictions developed. Some of these scenario’s assume that the airlines can increase revenue and reduce non fuel operating costs in an era of high oil prices. Oil prices have been negatively impacting airlines for some years now. For example in the QANTAS annual report of 2005 it stated that ‘Qantas’ greatest challenge remains the cost of fuel, which we believe will stay at the current high levels.3 As a result airlines for a number of years have been reducing costs. The easy cost saving options have already implemented, meaning that to further reduce costs will be increasingly difficult. The airlines will no doubt continue to raise fuel surcharges in an effort to increase revenue. Unfortunately for the airlines, each fare increase will result in fewer passengers, meaning that their Revenue Seat Factor or Load factor will fall, leading to further capacity reduction. 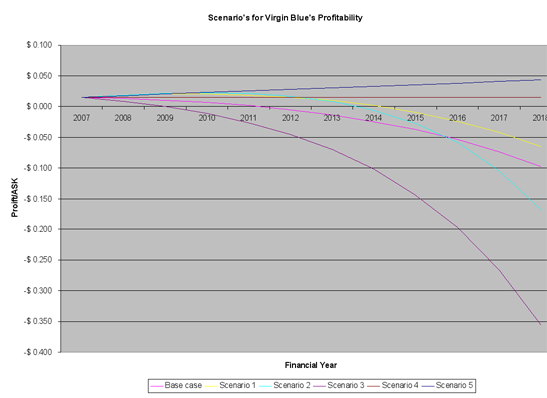 Chart two and three provides a summary of the profit/loss per ASK for the base case and the five scenarios for QANTAS and Virgin Blue respectively. Chart two. Summary of profit/loss for QANTAS against the base case and four scenarios. The price of jet fuel will continue to increase at or above the current rate as we approach and past peak oil. Both airlines will slow their capacity growth over the next couple of years before reducing it. Both airlines will attempt to reduce their non-fuel operating costs, although this may be difficult due to inflation. Revenue will decrease over time as fewer passengers can afford to travel, due to increases in the cost of air travel and the worsening economic situation associated with the onset of peak oil. I don’t see passenger numbers beginning to fall for a year or two yet, as I don’t think that the pinch from higher fuel prices has as yet significantly changed spending habits (either that or we are just going further into debt?). This most closely resembles scenario three, meaning that as early as 2010, both of Australia’s major airlines could cease to be profitable. At some point, if they continue to be unprofitable they will become insolvent. Those people who work for the airlines. Those individuals and funds managers invested in airlines, airports and associated infrastructure. The industry that supports aviation, including component manufacturers, maintenance and repair, air traffic control, catering etc. Airports, including the corporations that own them, security staff, retailers operating from airports, car hire companies, taxi drivers. Tourism, including tour operators, hotels, restaurants and retail outlets in tourist centres. Organisations that rely upon air travel for movement of personnel for meetings, courses and work such as mining, government and many other businesses. Public transport such as trains and buses. Telecommunications companies, particularly those support tele-conferencing, video tele-conferencing and other technologies allowing people to work from home. Oil depletion may slow due to reduced fuel demand. Hopefully Cambridge Energy Research Associates (CERA) vision of an undulating oil production plateau4 will eventuate (see here for a response to CERAs view5), demand will soften and the airlines will remain marginally profitable for the next decade or two. Personally however, I don’t ascribe to hope as a method of fixing problems, particularly problems of such magnitude. Not all revenue is derived from passengers. For example, only 79% of QANTAS’ revenue came from passenger revenue in 2006-07. The bulk of the remainder came from air freight and tours and travel services. Higher oil prices will likely have a negative effect on these revenue sources as well, so this should not have a significant impact on the model. Does not specifically account for changes in foreign exchange rates and changes in the oil price. My first model attempted to oil prices and foreign exchange rates to calculate total oil costs, however there was too many unknowns (such as hedging strategies) to make this viable. Does not consider the performance of differing groups within the airlines. For example QANTAS has domestic, international, regional and Jetstar amongst its groups. The performance amongst these groups could vary significantly. Whilst operating statistics are available for each of these business units, the financial data is not so easy to source. Historical growth rates are not an accurate prediction of future growth rates. To counter this, the model will be updated over time using a four year moving average. The FY 07/08 full year results will be interesting. The impact of oil supply disruptions has not been considered, however with minimal capacity to surge current oil production, we are probably only an extreme weather event, terrorist act or geo-political event away from physical shortages. This would most likely be a very costly for airlines. This analysis provides some very worrying findings. Both of Australia’s major airlines could become unprofitable within a couple of years if current trends continue and unviable at some point shortly after that. There is some hope that a reduction in capacity and non-fuel operating costs with a steadying of fuel costs may allow the airlines to remain profitable, but with peak exports likely past and peak oil in the not to distant future, this is a slim hope. From a risk management perspective, the collapse of airlines would have a major negative impact on the Australia economy. Based on this analysis, it is almost certain that the airlines will collapse, it is only a matter of time unless fuel prices are reduced, and quickly, to a more manageable level over the long term. Declining exports and discoveries whilst demand continues to increase, means that it is unlikely that this will occur. The net result is that Australia faces an extreme level of risk. With so much at stake, it would be reasonable to expect that our nation’s leaders would be doing everything in their power to prepare the nation for a new age of higher oil prices. Over recent weeks, there has been much discussion by the major political parties on issues such as FuelWatch6 and reducing either the GST or excise on petrol, but very little on practical methods of reducing our dependence on oil. I will leave it to you to decide how well we are being served by our leaders on an issue of such vital importance to the future of our nation. The final post in this series will consider the airlines response to peak oil, particularly looking at alternative fuels and new aircraft types and determine whether there is any hope for airlines and air travel in a world of high oil prices. For Charts 2 and 3, although you can't see out to 2018, you can still see the picture, unprofitable for base case, scenarios 1-3 and remain profitable for scenario 4 and 5. Qantas will try to offshore labour especially where a high AUD helps. I've cropped the image sizes now - hopefully they display corectly for everyone now - click on them to enlarge to full size. Its just a Mac - nothing too out of the ordinary. It is a fair bit wider than my PC screen at work though, hence my occasional lapse using large images - they look good to me. Airline travel is also public transportation! The conclusion that Qantas is going to become insolvent is assuming that it won't continue to increase air-fares. At 3-4L/100km, most trips use less fuel than driving. Trains and cruise ship travel is more expensive at present, buses very uncomfortable. 30 years ago we paid much more for air travel, and most will still travel by air because it saves time and money relative to alternatives. The biggest impact would be on retired tourists, who are not paid for lost travel time. The last 5% of oil availability will probably be used on aircraft fuel because there is not other ways of traveling overseas at 700km/h. All other uses for oil can be replaced by various alternatives. You're assuming that citizens of the world are going to have the money to spend on air travel. I suspect the first segment of society to stop flying will be vacationers who simply won't be able to afford it. Business travel will continue for some time but with declining global trade, that too will enter decline. Peak Oil is going to decimate the tourist industry. A huge number of people carve out a living in that business & it's going to have dire effects for some countries that need that infusion of capital. There comes a time when you think...I can fly there in 3 hours or drive in 2 days in a small car & I'll save 50%. You start asking yourself..what's more important, the 2 days you spend driving of the 500 bucks you save. If you're a family that's cash strapped, it's the 500 dollars. I figure the first airlines to collapse will be the economy carriers. They don't have alot of wiggle room & raising flight costs is out of the question for many. It's much easier to increase costs to a well paid businessman in first class. Has there been any work on Hydrogen planes ? You are not including all the costs of driving;1) uses more fuel for one person than flying 2) accommodation costs 3) loss of wages for 2 days or 2 days less vacation time. I would agree that for retired people time and even accommodation may not matter(sometimes the best part of the trip is the travel). Yes, if there is a complete economic collapse the airlines will go down with everything else, thats self evident. The question is surely will people fly even if they spend twice or even ten times the real cost of airfares?. We know form 40 years ago, they will, at least to travel overseas. As a student my first trip overseas in 1972 cost 6 months salary for the airfare. Today it would be 1 months of a graduate students salary. Similarly, if we still have business people, they will travel by air rather than drive 1 or 2 days. In the USA people are already shifting to driving instead of flying. Yesterday my cousin and his wife from North Carolina stopped by St. Louis, Missouri while driving to Wyoming. They decided on short notice to visit some reletives there and considered air fare (about $2000) versus two and a half days each way in the car. In comparing the gas cost to flying over half the $$$ is saved by taking their 28mpg car (3800 miles total / 28mpg) x $4 per gallon = $543. My cousin has a good paying job and lots of vacation time, so the time factor was not so important. Many middle and lower income people simply will not make the trip instead of taking the time off work to drive or pay the much higher air fare. The bottom line is that flying in ten years will be done largely by the wealthy people and business travelers, just like 45 years ago. Others will take a train or bus or, if gas is not rationed, take the car. Many trips will be foregone. I forecast air travel to fall by 30% or more in the next ten years. On the topic of using trains, I did read recently in the NY Times that Amtrak was booked right up. I was most shocked that Amtrak only has around 700 rail cars for the entire nation. Is Amtrak a private company or is it controlled by the US government? I'm Canadian, we have Via Rail, which was national for years, but that ended in the 80's. I don't think things are much better up here. IINM, Amtrak is a private company, but recieves annual funding from various levels of Government. The lower down the totem pole you go, the more generous elected officials are willing to be towards Amtrak. Amtrak itself came about as a result of pretty much every railroad in the US withdrawing their passenger trains. Moving people was never profitable (or perhaps marginally so), even in the heyday of the passenger fleet. Rather, it was the extra revenue generated by the mail that allowed the vast numbers of passenger trains to flourish. As air and road took larger and larger pieces of the Mail traffic away, the trains became unprofitable. At 3-4L/100km, most trips use less fuel than driving. That's a per passenger number. My car does 5L/100km on the highway, and with a family of four that's 1.25L/100km per person. At least twice as good as the most efficient airliner. You have the ability to travel much further in a given time period in a jet plane than a car, so even though the L per 100km consumption is pretty good, you can travel about 10x as many kms in the same time frame, and therefore burn 10x as much fuel. Jet fuel (I believe) has a 2.8c/L excise for domestic flights, and AFAIK, there is no excise on jet fuel for international flights. Compare that with 38c/L for petrol. This is a massive distortion in the tax system that favours air travel over ground transportation. The lack of any fuel taxation on air travel is exactly why 'The Airlines' are said to be the canary in the coal mine wrt. PO -as they are so highly leveraged to fuel costs and an incremental cost in the underlying wholesale aviation fuel price would have a much smaller effect. If they where heavily taxed and still in existance then they would have built a business model that works with higher fuel costs. Since their business model barely works in a cheap energy regime they will be absolutley hammered in the coming decade/PPO (Post Peak Oil). Its great that you have one of the most efficient cars, and you travel with 3 passengers. How many cars on the major roads between cities will have no passengers and will use >10L/100km? Also fuel is just the beginning of the costs of driving, extra Kms depreciate car, require additional servicing( not cheap under warranty) wear out tires. Also on many trips will require over-night accommodation. Good point about fuel tax, this is why we know that oil can go up to >$300 a barrel, Europeans have been paying this for years when you include taxes, and while $8-9 a gallon seems ridiculously expensive to US drivers they will adapt in time and the suburbs will not be abandoned. Wouldn't be surprised if most SUV's stay on the roads even if only used occasionally as the second car(insurance and depreciation still more than fuel for modest driving). European prices are not comparable with oil at $300/barrel since most of the money is tax - so it is just redistributes in the same economy, and in a sense is not a 'real' cost to the overall economy. Money paid out to the oil exporters is in a different league, and represents a real cost to the importer. Put simply, it has to be paid for. In a perfect world that would just mean that folk in oil importers had a lower standard of living, and produced more stuff for export to the oil exporters. In practise great swathes of invested capital are made worthless, for instance the aircraft industry to take an obvious example, and the car fleet running at 20mpg to take another, so massive losses are incurred over and above the nominal price of the oil. Tourists buy package deals, composed of airtransport and accomodation + food. That is the reason why long distance destinations are getting priced out of the market. Bad for Brits visiting the Aussies. On a more serious note, Air Berlin for instance is slashing it´s chinese destinations, and also Mauritius. From November, the second-biggest German airline behind Lufthansa will trim its fleet by 10 percent, cut long-distance services by nearly one-third and return 14 leased planes to their owners. German airline Air Berlin is reviewing whether it still makes sense to buy charter carrier Condor from Thomas Cook, Chief Executive Joachim Hunold told the carrier's annual shareholder meeting. There is still an awful lot of discretionary air travel that really is mostly unecessary but is done becasue it's cheap. I live in a regional NSW city and we get a steady stream of business day trippers that fly in from Sydney or Melbourne in the morning and then depart that afternoon. It has become so routine that they call it catching the "bus". I have been sent to Sydney for 20 minute meetings that could have easily been acomplaished via teleconference, which is what I now insist on with clients. We have Qantaslink, Virgin and Rex all servicing the route from to Sydney and the council run airport is now being expanded to accomodate three carriers. I suspect by the time the renos are finished, there will be at least one and maybe even two less carriers than there are now. However, for the next year or so my advice to everyone is that you may as well take advantage of the upcoming deals, and at least see those places that you've always wanted to see ...before the "final call" for affordable global transport! - I suspect this will literally prove to be a "once in a lifetime" opportunity. Thanks Cameron for this great post- maybe you can send it to Anthony Albanese's office? The STCWA is one of a few cty groups to respond to the Dept of Transport's issues paper on a National Aviation Policy (see http://www.infrastructure.gov.au/aviation/nap/files/SustainableTransport...). I think the Fed. government will have to buy back QANTAS if Australia is to have any sort of regional air transport system in the next 5-10 years. No-one in the ALP is yet interested in this idea, but maybe the Future Fund's $100 billion will be needed to buy back QANTAS and the national rail freight system, so Aussies can get around in the future? Buy it back? Buy...The government, if it absolutley has to have an aviation industry, should just wait until jet planes are virtually worthless and then pick up a whole fleet on the cheap. I seem to rememerb that there is a whole desert full of old commuter aircraft in the US. Hey don't we have plenty of desert in Oz? Maybe we should set up our own scrap plane yard and be the worlds depositry of used aircraft. Recycling the scrap value alone would surely ahve to be worth something? Any takers? (2) barter deals are made with Middle East countries "food for aviation fuel", e.g. wheat or sheep for Eid festivities against refuelling Qantas planes at discounted prices, en route to Europe, for example. The Commonwealth Governments Bureau of Infrastructure, Transport and Regional Economics (BITRE) website has a lot of statistics on International and Domestic Air Travel. So I guess it is likely that the capacity on these routes will be reduced first with aim of increasing their load factor. The last two of those routes could be easily serviced by 100kmh rail, with almost no time pentlty (consider the loading/unloading time delays when you catch a plane). Crazy. There is no doubt that airlines in Australia are in big trouble.The CEO of QANTAS said a few weeks ago that,if oil went to $200/barrel then "all bets are off". There still seems to be the classic disconnect from reality in government unless there is some furious paddling underwater going on.I doubt it.A good example is the second runway for Brisbane airport which is a billion dollar job as it requires dredging sand from Moreton Bay for fill.The airport site is swamp and not far above MSL.This is still to go ahead as far as I know. Outside of tourism, Australia,with it's vast distances,will continue to need some sort of internal air transport system even if it has to be subsidized.Are there any plans for this? - I doubt it. Meanwhile,QANTAS engineers are engaged in a campaign of rolling stoppages to secure a 5% wage increase versus the 3% offered.QANTAS is threatening to take even more of their maintenance work overseas.There is a name for this sort of thing in psychology but it escapes me at the moment. Hi Thirra, I and a couple of other peak oilers submitted papers to the Brisbane Airport New Parallel Runway project on the impact that PO will have on the need for the new runway, which were downplayed as seems to be the norm for the Government and business. I have heard since then on the grapevine that the Project Manager for this project has been stood aside and the airport is going to wait and see what happens to oil prices before commencing the project. Time will tell! I hope they don't build it because I believe my super fund is investing in it. I hope they don't build it because I believe my super fund is investing in it. Then get out of that superfund. If all employees did that, that would shut the money tap for those types of projects. There is a name for this sort of thing in psychology but it escapes me at the moment. That did not stop the Queensland government from approving a massive increase in coal exports, all contributing to sea level rises. The airport link is also planned, a doubly doomed project. The actions of our politicians are incomprehensible. Even before reading this article, I thought QANTAS should just give them the money. It's not like it'll make a huge difference in five years. Interestingly, On 730 Report/Lateline this week, they mentioned that a 3% deal had been struck between QANTAS and the Union negotiators, but the workers voted it down. Boy, are some peoples faces going to be red. Very interesting work Cameron. I like your focus on standard industry measures (ASK) and your leap to a simple growth comparison. I can hear an army of financial analysts huffing and puffing in the background and poking holes in your model. My response to them would be that it is a good thing to use simple numbers to raise questions about current strategy in time to avert a crisis if we are heading in the wrong direction. Personally I have no expectation that Australia's airlines will fail unless we have widespread national/global economic failure of a catastrophic kind. Why? Firstly Qantas and Virgin are masters of tactical and political manoeuvering - for example I bet that Qantas is delighted to be able to blame the striking engineers for cancelling dozens of flights this week because Qantas will be saving money on every flight it cancels. How? Through higher capacity utilisation in the fewer remaining flights and less use of the crappy old flying relics that Qantas engineers work so hard to keep in the air. Expect to see marginal services disappear from the timetables and fares and charges rise steadily as soon as the airlines run out of fuel hedging benefits. Also expect to see Frequent Flyer benefits trashed. I have cashed out most of mine. Secondly air travel is reasonably energy-efficient for single-person intercity trips in this huge country of ours. The emissions picture is worse by a factor of 2 to 3, but from the energy perspective you need to take a coach or train or put three or more people in a car to get from Sydney to Melbourne using less fuel per person than flying. My bet is that we will see a boom in intercity coach travel in coming years but that's another story. Thirdly there is a prestige, premium and political level of demand for air travel that won't go away whatever the price. Just take a look at the rows and rows of extra business-class seats at the front of all the 737s Qantas flies in and out of Canberra and the 767s used on the Perth route. When I look at the CityFlyer departure boards in any of our bigger airports the level of over-servicing and underutilisation screams at me. Expect more consolidation of timetables and fewer flights "every half hour". Fourthly Perth, Darwin and North West are pretty well inaccessible without air travel. I suspect airlines will survive, but in a very much different and smaller form than they do today. I also think that the government will need to become involved to avert the total collapse. The days of cheap and readily available travel for the masses however will soon dissappear. Fast electric trains will help. Here is a video of a French TGV achieving 574.8 kmh to break the world land speed record. I definitely support trains in your area as well as my native California. But, most electricity is coal- or natural gas-fired. Those peak too. SOlar panels only last 5-30 years depending on quality/type. Australia and California have Geothermal, Solar thermal, and Wind resources, all of which are currently under utilized. In the past this was because they were not cost-effective for competing with inexpensive natural gas. Since the price of gas has increased, these sources of energy are now cost-effective and will be built, replacing the gas fired plants in almost every application except peaking units. Transportation is often said to utilize 50-75% of oil fuels, maybe i am misremembering. I don't know what part of the total energy usage pie electricity is. But even if CA generates that much renewable energy -- will it go towards buildings, lighting streets at night, industry, pumping water, transport or food? All important, although not in that order. I don't believe that renewables can power all of the above--our current standard of living. A look at "shadow cities" (squatter villages) around the third world might be indicative. Based on what happened to the Hawaiian airlines (two died- went out of business- this spring) I see that the future of air travel is the same as the Concorde. Museums and salvage. Industrial society has been nice, and industrial man entertaining. We find here that in 2005 the world had a total energy consumption of 15,500GW; the rise from 1980 to 2005 was 2% annually. But of the 15,500GW, only 2,000GW is electrical energy today, with an average annual rise of 2.79% over the same period. Over the same period, world population increased at 1.14% annually. So per capita energy use has been going up 0.86% annually, but electricity use 1.65%. Basically the difference is because when developing economies develop, one of the things they do to develop is to put in electrical grids. Plus, electricity is a very versatile form of energy. You can do more different things with 1MWh of electricity than you can with 1MWh of burned oil or wood or whatever. Anyway, presumably when absent fossil fuels we'd be entirely electrical, to create an entirely electrical society using the same total energy as today, we'd need to add 13,500GW to delivered electricity, multiplying generation overall by almost eight times. We could probably reduce that need a lot because electricity as well as being versatile is often more efficient, and by things like trains instead of personal cars, and so on. But still, given peak fossil fuels, we're looking at having to not only replace our entire fossil fuel-sourced electrical system, but build a few more times on top of that. It's doable. Rises of 2.79% annually only give us a doubling every 25 years, so it'd take 75 years to add eight times the present capacity. But places like China have managed rises of 6+% a year for a decade or more at a time, giving us doublings every 12 years, letting us add eight times our present capacity in 36 years, toss out the old fossil-fuel based capacity, and still have seven times as much as today - 14,000GW. Sure, by 36 years from now we might have 9 billion people, but again, efficiencies of scale and organisation are possible. And that replaces the entire world's energy needs by 2045, if we started next year - just in time to stop burning fossil fuels by 2050 and make the IPCC happy. Australia also has little darlins' that place rocks and stones on the tracks; Not to mention dropping stuff off bridges! How's the security in France? increased freight will cause very significant problems. Any future transport has to use electricity in the longer term. Using motorways to convert to rail would be fine on flat land. The allowed gradients are likely to be different in more mountainous country though - experts such as Alan would have to comment, although it also partly depends on how the engine is specified. "SOlar panels only last 5-30 years depending on quality/type. then we just build more solar. I don't know the quality of the panels you use.. but here in spain (one of the leading countries, just behind germany) they last 30 years at 70% nominal capacity MINIMUM, then another 15 years up to 50% capacity. How cool was that shot going under the bridge? Boys and their toys! We don't even need TGV-level technology. Fairly low-level technology is needed to allow trains to travel at 100-150kmh. QLD's Tilt Trains even use passive tilt (simply put the axis above the centre of gravity). For example, Sydney is less than 500km from Brisbane. At 150kmh that's only a bit over 3 hours. If you fly, it takes half that just in the air, before you allow time to show up early for boarding! Used to be 1000km from Brisbane to Sydney. No doubt global warming has pushed the subtropics further south, so that's probably why the distance is now only 500km. But profitability even in the good years is generally low, in the range of 2-3% net profit after interest and tax. In times of profit, airlines lease new generations of airplanes and upgrade services in response to higher demand. Since 1980, the industry has not earned back the cost of capital during the best of times. Conversely, in bad times losses can be dramatically worse. Warren Buffett once said that despite all the money that has been invested in all airlines, the net profit is less than zero. This suggests the airline industry can survive, even survive nicely (as a whole) while losing considerable sums (as a whole). It's almost the original model for an Internet stock: technology of such undeniable attraction that money keeps showing up despite no proven profit model being in place. The limiting factor then isn't the expense of fuel, but the availability of further investments. The airlines' future (on the whole) depends not on oil but on speculation. they get 30% better fuel/passenger mile. Because of this future overriding issue, I think that the smaller regional jets will be replaced with more efficient turboprops, even if they are not as 'nice'. Qantas won't be the only ones doing it - apparently turboprops are now outselling regional jets 2 to 1. The answer to this situation is not that difficult. 1) They will have to raise ticket prices to the point where they can actually make a profit. 2) This will result in less airline traffic. 3) I think you will see the return of some sort of regulation to keep airlines from going off the deep end with their normally self distructive tendencies! You will see airlines as more like a utility. Then when another economic boom starts, they will want to go back to deregulation! 1. When they raise prices, less people fly and the remaining portion fly less. However, most of the fixed costs for the airlines remain. End result = losses in either case. They are not cutting, because there is overcapacity, they do not want to lose market share and most think this phase of very high oil prices is a temporary aberration. So they are just trying to weather it out and hoping that others die first. 2. I think this is inevitable in any case, barring some wonderful new X, that none of us can think of. 3. Or even *gasp* nationalization. Shareholders don't like losing money, so they will abandon sinking companies. Historically most countries have had a national airline. I wouldn't be surprised if they were re-nationalized again if things get ugly enough. Somebody needs to fly all those business suits all over the world for loss. And it sure isn't going to be private owners, so they will demand that the government will pick up the tab for them. When/if things pick up, airlines can again be privatized (remember this may not be an on/off matter, it can be a matter of how many shares each party owns and who covers the losses in the end). So from 2003-2007 fuel costs increased 36 and 29% for the two airlines - do you know how much airline tickets (to the customers) increased over this time? At what point to the rich, or semi-rich become the only people able to fly? Does this point or nationalization of the airlines come first? I think one thing your missing is that potential passengers themselves will suffer from less money available for air travel as peak oil/housing bubble issues become greater. Assuming that oil prices and other factors are now shrinking disposable income and that fare's are being increased the addition of a reduction in the number of people willing to travel should happen before 2010. A quick google search shows Airlines get hit hard during recessions. Given the data you seem to have I think you could find the profitability of your particular airlines during a recession. Also its almost impossible for a Airline to increase fares during a normal recession. In short these Airlines should face serious problems well before 2010. Assuming a pretty much global recession will be in force in 2009 and also assuming oil prices will rise faster than in the past just given export land alone. We would expect them to lose profitability by 2009 and probably even as early as late 2008 . Given that I expect losses to be steeper then your suggesting they should be having serious financial problems by early 2010. Cutting routes and taking losses on planes etc does not do a lot of good if people can't afford the fares. I can't imagine they could transition fast enough to prevent serious losses the time interval is simply to short. Quantas got hit during the last downturn following the terrorist strikes. So I don't think its far fetched to see a normal recession coupled with rising fuel costs making air carriers unprofitable earlier than 2010. Qantas got hit during the last downturn following the terrorist strikes. The collapse of Ansett meant salvation for Qantas and Virgin in the post-911 environment. Ansett collapsed on 13 Sep 2001. It wasn't the terrorist attacks that collapsed it, it was mismangement by Air NZ which has still not been adequately examined byt TPTB IMO. It did allow Qantas and Virgin to survive the downturn. I believe in the US there are more and more parked planes, Also I cannot see airlines investing in more efficient aircraft as this just prolongs the agony, hence Airbus and Boeing are in for a hard time. "Also I cannot see airlines investing in more efficient aircraft as this just prolongs the agony"
the history of airlines says otherwise. they are in between a rock and a hard place. For example, Virign has orders in for a reasonable number of new aircraft. They either continue with the order (and park them/retire older aircraft) which will be costly or pull out of the order and have the financial penalty that would result in. QANTAS is in a similiar situaton - needs to replace ageing aircraft, at great cost, in an environment where demand will decrease. I think this will well and truly overwhelm the airlines, governments and busineses ability to respond. Hedging. Derivative fuel price protection hedges may work as long as oil futures curves are inverted. They are now normal. This means that it is difficult to hedge via futures contract and it also makes subsequent derivatives sold by 3rd parties much more expensive for any airline to buy. That is, the price of the hedge may negate much of the price rise in oil. Example: Qantas fuel hedges incurred a loss of -$39.8M and derivatives a loss of -$71.4M. These are significantly worse from 2006, when the hedges results in positive gains. Fuel efficient fleet. Airlines which have planned to renew their fleet with fuel efficient planes: A380, Dreamliner 787, A350XWB and the like can offer -20% to -30% savings in fuel usage, depending on existing fleet (other things staying the same). This can significantly reduce fuel costs. For instance, Qantas 2007 flee consists mostly of 717 to 747 aircraft and some A320/A330 series. The improvements of earlier mentioned aircraft on fuel savings are significant (on order of -10% to -30% for kerosene), even if they are not guaranteed to negate the effect of fuel price changes. A380 and 787 become operational in 2009 for Qantas, but of course only part of the fleet is switched over to the new craft. Revenue seat factor. When this goes down, so do the profits, rapidly. A Change of -1% can be significant, when the airline is already operating near profit-loss margin. This is not yet the case for Qantas, but it is reality for almost all US operators. The more pruned down the operations are, the harder it becomes to cut more. As such, the effects of revenue seat factor loss become progressively more severe IF airlines are forced to keep cutting expenses year after year (i.e. price of oil keeps going up steadily). Also, see recession for extra effects. Fare price changes. An important portion of the recent growth in air fares is not just from business travel, but from middle class flying further and more frequently. This demand is highly price elastic and adjusts rapidly as fare prices increase, again bringing down the revenue seat factor. Thus, airlines are constantly optimizing how much can they even theoretically increase fare prices (which causes a loss in demand), because fuel prices have increases. Currently this theoretical increase is not possible for many, due to overcapacity in the industry. However, below this easily adjusting demand there is demand that may not be cut as easily (e.g. bulk of business demand in a non-recession scenario), which may offer a period of support for profitable fare price increases, but only up to a point. In a recession scenario, this support can rapidly fall apart. I have no example breakdown of client segment volumes for Qantas on this. Recession. During recession people fly less. Revenue seat factors go down and so do fare prices, both can incur great losses. This may also happen before the fuel prices drop due to shrinking demand, causing a short period of extreme financial losses. Personally if we go to recession and Asian demand growth for oil doesn't significantly drop while bringing down the oil prices, we can expect a lot fewer airlines, with a lot less routes and much lower frequency of flights. Emission trading. If EU emission trading starts in 2011 for airlines (I doubt it), then this will eventually spill over to other areas and at the very least to operations to Europe for any airline, including Australian airlines. The effects can be significant. In 2007 the EU airline industry was able to make a combined profit of €3.7 billion in a time of extreme growth and fairly high economic growth. The emission trading scheme for EU airlines alone is currently estimated to cost €15 billion a year. This would totally wipe all the profits and force many airlines bankrupt in a just a few years. Do you see why I don't believe in the airline emission trading scheme starting in 2011, the year when even the conservative IEA assumes a major oil supply/demand crunch, much worse than what we are experiencing now. BTW, Chris Skrebowski's (of Petroleum Review) current estimate is that we'll be peaking globally roughly by that time. Kerosene Crack spread. Kerosene has risen in price faster than crude oil (i.e. kerosene crack spread). This has been probably due to refinery mismatch and the very rapid rise in demand for diesel (a mid-distillate like kerosene). Until the refinery balance is restored or demand for diesel drops (unlikely, as it is used in electric power generation, not just cars), kerosene crack spread may remain well above the historical averages, or may even rise. This incurs an additional price increase of c. $25USD/per barrel over the crude oil price currently. Fuel delivery disruptions. This is the bogey nobody wants to talk about. Everybody assumes that the markets will operate without disruptions, and that only the prices will fluctuate. Readers of this board however are aware that when spare capacity is as tight as it is, unexpected disruptions anywhere in the fuel chain can easily cause temporal geographic losses in either crude or fuels. I'm not sure how well airlines are insured against these, but a loss of operations fuel for even days would be severe to many, both on financial and reputation level. If the margin remains tight for supply/demand, I see the likelihood of this going up as a function of time, not going down. Again, barring worldwide recession, which may bring us more spare capacity, but which will bring different kind of pain to the airline industry. I would be very interested in hearing from others about additional upside factors that are already on the horizon. I don't consider syn-fuels or bio-fuels to make any significant impact in the next few years (too low volume, too high cost). Wing tips and weight reduction in planes is mostly already in use and the effects are marginal (a couple of percentages at top). The only possible event for the airline industry that I can think of, is that the price of oil would plummet to $70-$90 per barrel (current dollar value) and the kerosene crack spread would normalize, both for some unimaginable reason (a black swan). If this was to happen without a worldwide economic slowdown, then airlines would at least get a breather. However, whether it would be anything more than a breather is in serious doubt. Things look pretty severe beyond 2011 and by 2015-2017 we are probably into uncharted territory. Caveat emptor. I'm not an airline industry insider. I have a professional interest in the matter, but I have been known to be wrong and it would be foolish to assume that this has changed. PS Sorry for the lack of references for many numbers/predictions. These come from such a wide variety of sources and I don't have material pre-prepared for this. my first and hopefully not a stupid question - this seems a good place to ask this. on the topic of 1) hedging I was wondering, where do airlines go to place fuel hedges (banks? insurance companies? ), and how are these institutions affected by economic and financial turmoil? eg. Southwest has fuel hedges well below current fuel price, but is there any risk of these becoming worthless by bankruptcy of its hedging partner? It depends. Some buy straight exchange traded futures some over-the-counter custom derivatives. Southwest has preferred OTC, apparently because they think it is more customisable. The offering party is then an investment bank or another type of financial institution. This of course creates the counterparty risk you refer to, which the banks then hedge against themselves, etc. In effect the risk is supposed to be spread throughout the financial system. Further, players usually break down the hedges to different phase of oil price development (low price, mid-price, high-price) and dynamically vary their hedging assets throughout these cycles. This is my very thin knowledge on the subject. Experts from this field can correct if I'm wrong. You make a good point about hedging, i.e. counterparty risk and this type of risk is widespread in many industries. Simplified it is important to remember that any deal is only as good as the backer. If you are insured (hedged) then the insurance is only good if the insurance company is in business should you have to claim. For example; in foreign exchange if two banks deal e.g. EUR (Euros) vs USD (USDollars) then one bank will sell EUR and the other sell USD, each side of the trade is paid separately. Taking time-zone differences into account, this heightens the risk of one party defaulting if the EUR are paid before the USD. As a result methods such as netting have been devised to minimise this risk. - More flexible, interactive and GPS-based flightpaths for airliners. Fuel is saved through shorter track distances, minimised acceleration/deceleration and climb/descent, better use of forecast winds, less queuing in stacks. - Future "Flying Wing" or "Blended Wing Body" airframe designs for around 1/3 lower drag. Another factor for those from US and UK is weak currency relative to Euro and some other currencies. Those already hit by higher food and energy costs at home plus more expensive / difficult borrowing will be reluctant to fly to eurozone, for example, where their effective costs are 20% up in just 12 months. I do like reading views on where the Airlines are going because it seems to me that -like Concorde- air travel is a key symbol of our modern age. The phsycological effect of Dozens of National carriers going to the wall will be immense as our interconnect globalised economy is seen to unravel before our eyes. I do not think tourism will die as everyone likes a break, but it will become more localised again. Q. In the seventies oil prices went up 10 fold -what impact did this have on air travel numbers and if it had little impact why do we think it will this time around?? I used to fly the big jets on the Africa Australia route way back. I have very little sympathy with the Airlines. They have forgotten their mandate. An Airline's mandate is to transport its passengers from A to B as safely as possible, not what our modern Business-Insanity-Model tells them they should be doing. We extended unsustainable "Living and commuting" to the other-world suburbs. We started to advertise "dreams" to get everybody flying whether they wanted to or not. We kept giving them more and more rebates and unworkable fares. Boeing became fat and lazy, the other big names disappeared, Airbus saw only dollars in front of their eyes. Everybody was making insane amounts of money out of a non-sustainable industry. I was in Light Aviation, when Mr Piper wanted a small plane in every garage. I always had a J3 Piper Cub, an Aeronca and a Piper Cruiser in my garage. After the 1975-80 Avgas price increase, escalating costs, and insurance costs, the industry never recovered to its former glory. All people in aviation should know, "There is no money in aviation"
The Airlines were in La La Land. They kept pushing the envelope. They reached the point where each aircraft had to be in the air about 20/24 hours and a seat percentage of over 80%. This is absolute insanity. They literally had to Press-gang passengers with offers they could not refuse to get the seats filled. Like the Housing bubble, offering 100% Mortgages, the airlines had to offer damn near 100% rebated prices. Tibucktoo to Timbuck three for $1 if you had brown shoes and booked ten years in advance. Well! the day of reckoning for houses and aviation is here. The Airbus 380 will be the last dinosaur flying and Dubai will fade back into the desert. I noticed that you had one air freight service filing for bankruptcy. I think it will be interesting to watch to see what happens to the air freight services in the next couple of years. People like United Parcel Service (UPS), FedEx, AirBorne, etc... As business turns down their services could be hit pretty hard? Air freight volume is down for all the carriers. I think you will see them begin to pull planes from service - not sure if they publicly report such numbers. At some point they will probably stop delivering (ground) to remote areas. General residential deliveries will probably eventually retract to a Monday-Wednesday-Friday schedule. Diesel or kerosene, Air or Ground, it doesn't matter in the long run. They are getting hit across the board. Nice work damfino. Summarised like that it, it is very confronting. It would be interesting to graphically represent that in some way. It would be interesting to graphically represent that in some way. Airlines appear to be losers. So maybe another post on the nature and state of the ship building industry in Australia? People traveled for hundreds of years by ship - And it is a much more civilized way to travel long distance. And no "Jet Lag" to deal with upon arrival. With modern global internet connections the time spend traveling by ship could be just as productive as telecommuting from home. Modern sail powered or assisted passenger ships might be a "growth" industry in the near future? Or maybe nuclear powered passenger ships? There are viable alternatives to air travel. Some may mean some adjustments to our ways of thinking about travel time. Hydrogen would actually be cheaper (call it electric powered flight) but after the Hindenburg probably not going to get off the ground. ;) IIRC the Hindenburg didn't catch fire due to its hydrogen exploding but the Aluminium impreganted skin becoming wet and full of static charge when it arced to the ground. The Hydrogen would not have helped of course but it may still have burned even if it was filled with Helium. Besides that we have probably reached peak Helium which needs to be mined and is now in decline. Large passenger ocean going ships might make a resurgence, but it will require sustained economic stability before anyone will invest in this. I don't think you will see the flying kangaroo on any ships any time soon. There was a company that tried that in germany... and had to close shop. Zeppelins are very expensive to manufacture, and storms are very dangerous for them. They just can't get so high as to get to aJet-Stream.. for that you need a Jet powered airplane. As for travelling by boat.. you can't. I mus travel on monday from spain to bahamas and back on friday.. It would take me at least a couple of weeks by ship!! You are absolutely right !! !